An excellent Nutritional Supplement for Digestive Problems. An easy to swallow capsule makes for a very easy to use product. Suggested Use: One to three capsules per meal each day or as directed by your Health Care Practitioner. Enzymes are responsible for functions in the body such as digesting food, building bones and tissues and aiding in detoxification. Many of today's food allergies stem from the lack of certain enzymes. Joint pain and gout can be a result of undigested proteins, fats and minerals which form uric acid crystals that "get caught" in the joints. What to do?? Replenish your already taxed and depleted enzyme supply! 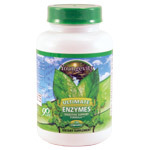 ENZYMES is formulated to support all aspects of digestion, including absorption. Dr Wallach: Exercise without optimal supplementation is suicide! Other Ingredients: Rice flour and gelatin capsule (gelatin and water). Directions: Take one capsule with each meal, or as directed by your health care professional.